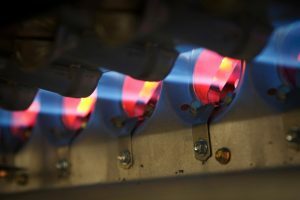 Common Issues in Gas Furnaces and Fireplaces | MarGo Plumbing Heating Cooling Inc. When starting up your fireplace or furnace for the first time in the fall, it’s not uncommon for the burners to ignite dust, dirt, and pet dander. This creates a distinct odor that may circulate through the home for a few hours. Rest assured, however, that there’s no harm in this odor. If this smell persists while using a gas furnace, it could be an indication that it’s time to replace the air filter. In gas-burning appliances, it’s not uncommon for strange noises to follow—especially if you haven’t had regular maintenance performed on the system. Strange noises are almost always an indicator that something is wrong with one of the components in the system. It’s best to have it checked by a heating repair expert in Clifton, NJ than to ignore it. Screeching or grinding: This could be due to a blower motor in need of repairs. Not all gas fireplaces have these blowers, and the modern ones that do are usually quieter than ever before. Rumbling: If you hear a rumbling after the burners turn on, it most likely means that you need to have them cleaned. Roaring: A pilot light with an improperly adjusted flame could be the source of a roaring noise. Ensuring proper ventilation is one of the most important parts of owning a gas-burning appliance. Without it, deadly carbon monoxide can leak into your home and endanger your family. Any home that uses these appliances needs to have carbon monoxide detectors installed in the home, but preventing the leaks from happening in the first place is always ideal. Ventless Fireplace: While some gas fireplaces don’t use any vents at all, that doesn’t mean they can be carelessly operated. Some states have even outlawed these types of fireplaces because of the danger. But as long as you operate them properly, there’s little issue with them. Vented Fireplaces and Gas Furnaces: These appliances will use a flue pipe to send any exhaust into the outdoors. And of course, fireplaces can be installed with a chimney to complete that aesthetic appearance, but one must always remember to open the flue or chimney damper before burning. When gas appliances fail to operate, it’s almost always due to one of the various starting components. While not difficult to fix, they can become worn out over time and will need maintenance or replacement. At other times, it could be a simple operational issue. Gas valve: If the gas valve is closed, you can be that there won’t be any combustion. Make sure that the valve hasn’t been shut off. Thermopiles and Thermocouples: Which one you have in your appliance depends on its age, but they both essentially perform the same function—to ignite the gas. These parts can wear out with age or need adjustment. Burners: A buildup of dirt can prevent the gas burners from firing properly. Got an issue with your gas appliances? Contact MarGo Plumbing Heating Cooling Inc. today to schedule a service.